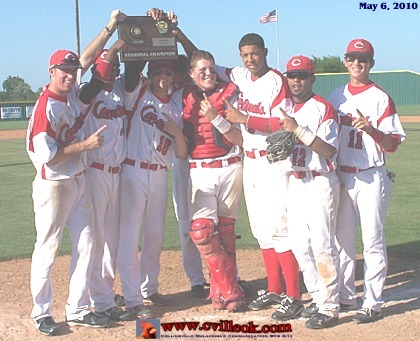 The 2010 CHS Baseball Cardinals posed with their 5A Regional Championship plaque Thursday May 6th after eliminating Tulsa Memorial. 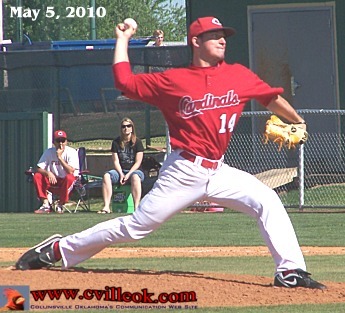 The Cardinals were already Metro Lakes Champions with just a single loss in their first year in that conference. 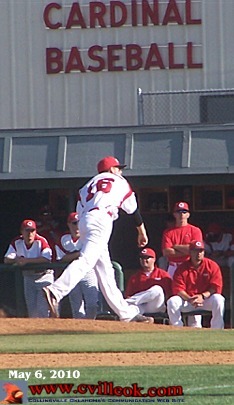 Nick Goza pitched the Cardinals to victory Wednesday with an 11-5 win over Grove. 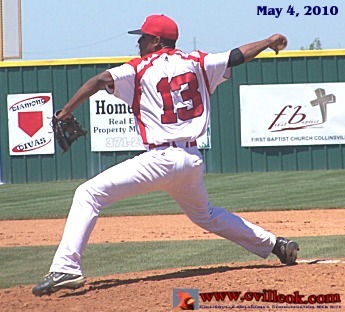 Peter Rodriguez started the Cardinal regional sweep with a 13-0 win over Tahlequah Tuesday May 4th. 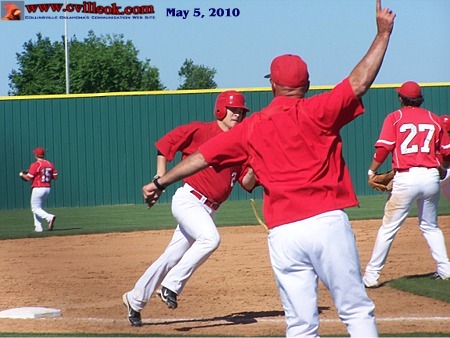 Luis Dejesus' diving stop followed by throwing out the Tahlequah runner at first exemplifies the 3-day solid defensive effort by the Cardinals. 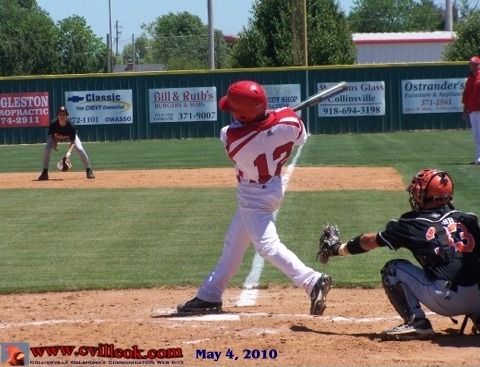 Jose Olazagasti added 4 runs with this grand slam swing against Tahlequah. 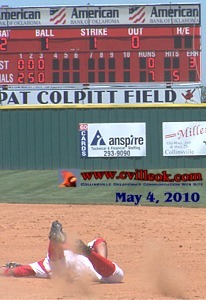 CHS Head Coach Tony Reeder waved 11 Cardinals to home plate against Grove Wednesday. The 2010 baseball seniors celebrated with the regional plaque having completed their final home game at Pat Colpitt field. 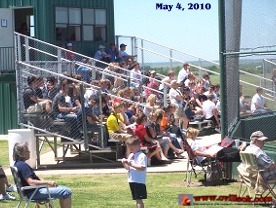 The largest crowd of the 3-game series came at the 1pm game Tuesday with the remainding games at 4pm. 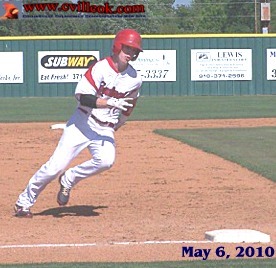 Trent Lee doubled then scored on Brent Werdell's double for a 2-0 lead in the 3rd inning against Memorial Thursday. 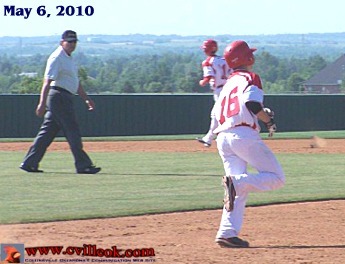 Randy Rogers (#16) helped his pitching cause Thursday with a pair of two run homers against Memorial. 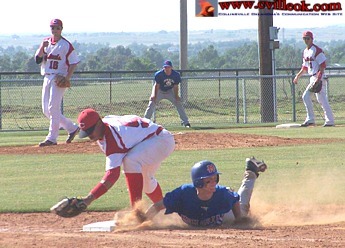 Luis Dejesus (with a pick off attempt from catcher Jordan Musto) was too late to get this Memorial base runner Thursday. 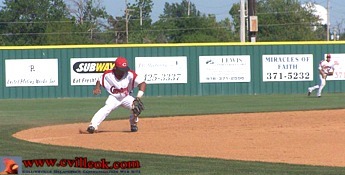 Short stop Jose Olazagasti with a back hand stop for a toss out of a Memorial runner at 1st base. 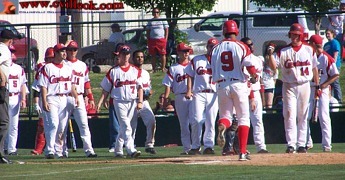 Luis Dejesus (#9) added a solo homer in the 6th inning against Memorial.